Millions of people suffer from the office chair disease. When you spend hours slouched at your desk crunching numbers and working on projects, your body takes a beating in the process. But with technology developments, you can now say hello to an under-desk cycle. Developed to help mitigate the effects of sitting for hours, the under desk bike is the new way of exercising while working. How Many Calories will you Burn while using an Under Desk Cycle? Will an Under Desk Cycle Strengthen your Quads? Assembling a Desk Cycle and an Elliptical: Is it a Complicated Process? What is an Under-Desk Bike? It is hard to balance work and social life let alone have time to exercise as well. In a bid to fight the sedentary life, the under-desk bike was developed to help you to expend more calories than if you are just sitting typing behind a desk. These bikes are designed to fit under the desk so that you can pedal without hitting your knees under your desk. They are a form of low-impact exercise with different resistance levels so that you can exercise hard without putting any extra stress on the joints and they are quite as well allowing them to be used in almost any office environment. Many people report constant fatigue and increased weight gain because of a sedentary lifestyle. But you can kick-start a healthy life by pedaling while you work. You may not get the full benefits of an exercise routine, but you are sure to expend double the energy than if you just sit in your chair. Even so, any form of exercise comes with higher energy levels, lower stress levels, a happier life, and a longer lifespan. The benefits of working out at your desk have been publicized. Everything from weight loss to improved blood pressure, you have every reason to get an under desk cycle. If you hardly have time to exercise, having an elliptical under your desk will work your calves and get your heart rate up. You will be more alert since more oxygen is being pumped into your brain. As such, you get more work done as your mind is more attentive. Modern offices have air-conditioning that make the office too cold for comfort. Instead of bringing in scarfs and coats, you can warm-up just by exercising away under your desk. Many people attest to not wearing their jackets and ditching the scarf thanks to the warmth you create by incorporating a form of exercise at work. You have to be in a proper upright position if you wish to exercise correctly using an under desk bike. It saves you from lower back pain which is usually a result of sitting with poor posture for prolonged periods of time. You don’t have to worry about distracting co-workers while using an under desk cycle. This is because they are designed to have smooth motion while you move only your legs. They do not have tracks like in treadmills which are quite loud and distracting. Adding fitness to your routine is as easy as incorporating the Cubii Elliptical in your daily life. This compact Under Desk elliptical is designed to be portable and lightweight such that you can use one in the office and at home. You can now burn as much as 150 calories more by sitting behind your desk and walking at the same time. It is ergonomically designed to help you achieve proper posture and unobtrusive motion. It has a silent operation that will not distract you or your co-workers. Cubii is the only smart under-desk elliptical on the market currently. It is Bluetooth-enabled so that you can connect to Cubii Android and iOS app. You will be able to track calories burned, miles, strides, RPM, and minutes. You can also create and join exercise groups, so you can be motivated to work out as you compete with other Cubii owners worldwide. The Cubii Jr. is a compact model that will slide under your desk discretely. It provides an excellent way of moving while at your office so you can remain active throughout the day. It is built to be short so that it will fit under the desk and you will never hit your knees on the bottom of your desk. Cubii Jr. is designed with comfort in mind. It provides smooth exercise without putting any extra pressure on your joints. Not to mention, it is developed ergonomically so that you will be able to maintain a proper posture for cycling and performing office activities. With the display monitor, you will be able to track the RPM, calories, strides, and the distance you cover. Not to mention it has eight resistance levels to help you adjust the intensities of your workout. DeskCycle is a popular under desk bike that is revered for its innovative features. You can work out in the office, while relaxing at home, or just watching TV. 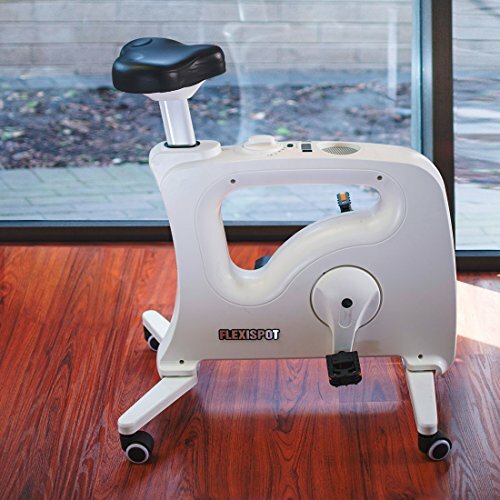 This under desk cycle features magnetic resistance to give you smooth pedaling all day long. The pedal height is only 10 inches making it possible to use with desks that are only 27 inches high. This means you don’t need a desk makeover to add it under your desk. This model offers Velcro foot straps to keep your feet balanced and comfortable as you cycle. Its wide base keeps it stable throughout all the eight intensity levels. Resistance is quite crucial if you are looking to burn calories since it has intensities that are suitable for almost all fitness levels even athletes. The Platinum Fitness Fit Sit Deluxe is a lightweight model that folds compactly for transportation and storage. It is the only model you will need if you are constantly on the go covering business meetings in different locations. Or are looking to spend a less amount of money. With the help of the new coolrev technology, this exercise bike will not overheat no matter the intensity. It keeps you safe from coming into contact with any hot parts meaning you are never at risk of getting a burn. The LCD provides a readout of the standard exercise parameters including the revolutions per minute and the calories burned. It comes with the battery and anchor strap to attach it to your chair. This bike makes it more practical to live an active life without investing in a high-end product. If you use a standing desk, you are probably familiar with how annoying it can get. But you can get good breaks by using an exercise bike designed for your standing desk. Flexispot also follows through with a smooth operation as the pedals are barely audible. You will be able to concentrate on important tasks as it is unobtrusive. With eight resistance levels, it offers the ideal intensities that make it easy to get to the perfect resistance no matter your fitness level. This model also has a height-adjustable seat. You can use it with desks that are as high as 40 inches or as low as 30 inches. You will not need to assemble any parts. Just buy it and you can start exercising right away. 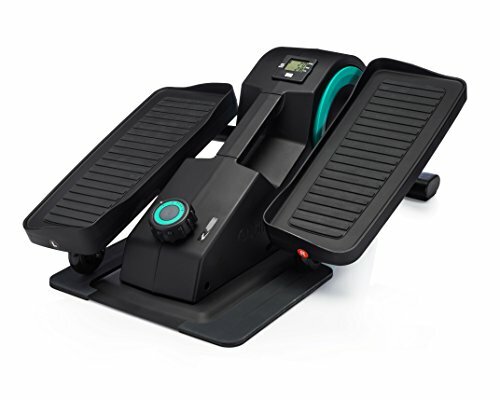 The number of calories you burn while using a foot peddler is determined by a number of factors. One, your weight is a major factor followed by your cycling pace. For example, if you weigh 136 pounds and have dialed your desk cycle to a low resistance, you are going to burn around 107 calories every day. That is not much but considering you are not giving up your eating habits. It is a plus since you will lose a pound every seven weeks. Remember that; the more you weigh, the more calories you will burn. The muscles involved in cycling a foot peddler include the calves, glutes, hip flexors, hamstring, and quadriceps. To strengthen your glutes, you will need to use the resistance feature in the bike. This feature increases the intensity of the workout and improves your quads in the process. 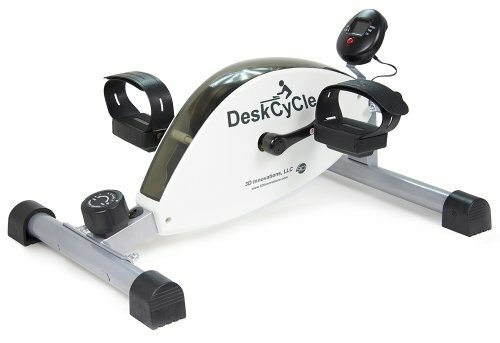 Desk bikes simulate cycling using circular motions. They work much like the indoor bike in that you will be using your legs only and will be seated in an office chair. These bikes have resistance levels which provide the intensity of riding a bike. With a desk elliptical, it can simulate walking, climbing the stairs, and even running. 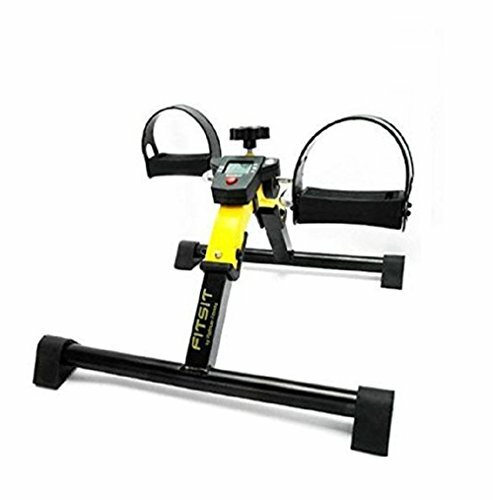 It is also a low-impact exercise machine that has different resistance levels to provide various intensities according to the resistance level that you set it at. There are not many parts to assemble in a desk cycle. You can assemble it in a few steps since it comes mostly preassembled. You will get the left and ride pedals which are screwed into the left and right sides of the cycle or elliptical respectively. For a desk cycle, it may take longer since you need to install the front and the back leg which is followed by the pedals unlike an elliptical where you only need to install the pedals in two or three steps. Since daily life is complicated enough, it is hard for many people to stay active throughout the day. That is why Cubii invented active sitting. One of the founders of Cubii discovered this form of exercise while sitting for hours during an internship. From the first prototype to their most advanced Cubii smart Under Desk Elliptical, this brand has come a long way. Today, the Cubii elliptical is a NEAT ® Certified for active sitting. It increases sitting energy expenditure by more than 10%. The DeskCycle is a brand by 3D Innovations LLC. This product is a design resulting from customer feedback. The DeskCycle was then developed to make it easier and convenient to get healthy exercise all day, all week, at any place. You will not be able to burn calories anywhere close to that of a normal exercise routine. As such, you must incorporate other forms of exercise to reap the full benefits. An under-desk bike is a great supplement to a regular workout routine and can help you burn additional calories but cannot be your only form of exercise if you are intent on losing weight and improving your physique. If your desk is short, you will have to adjust the chair to a lower position so that you can reach the cycle and pedal without hitting your knees under the desk. In the process, your computer may be too far away from you making it hard to read the screen when seated further away from the desk. While you can increase the font size on the screen many people find it cumbersome to switch font size on their computers multiple times per day. While you can walk and type at the same time, typing and cycling is a different story. This is because the brain has to concentrate on driving your legs in a circular manner which will be a distraction if you are a typist trying to complete work as fast as you can. Fast cycling is only applicable if you are browsing, watching videos, and other stuff that involves consuming content. An under-desk cycle is a perfect way of getting rid of the “I can’t find time to exercise” excuse. We have researched various products in the market to find the best under desk cycle. You can expect smooth pedaling and silent operation from our top models. These brands showcase innovative features to kick-start an active lifestyle. 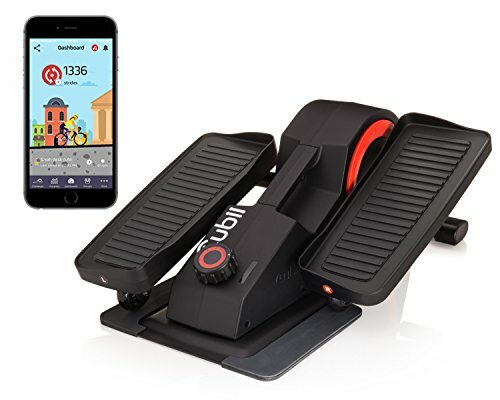 Our Best Under Desk Cycle is the Cubii Jr. It has all the essential features, and it comes at a reasonable price. We have also included innovative designs like the DeskCycle and Cubii Pro models for those willing to spend more money for additional features. ShapeJunkie.com is a participant in the Amazon Services LLC Associates Program, an affiliate advertising program designed to provide a means for sites to earn advertising fees by advertising and linking to amazon.com.